The Very best flats line on the market—perfect for bones, perms and poons with low stretch performance. Some lines cast far with ease, but leave you flailing when fish show up at your feet. Others do just the opposite. How do you create a line that does everything on the flats better? With our new Flats Pro line, it’s a matter of what we call the four Ts: Taper, technology, testing, and…more testing. Technology: When you’re casting to moving targets, you need a direct connection to your fly the second it hits the water. Memory-induced line curl leaves you out of touch. 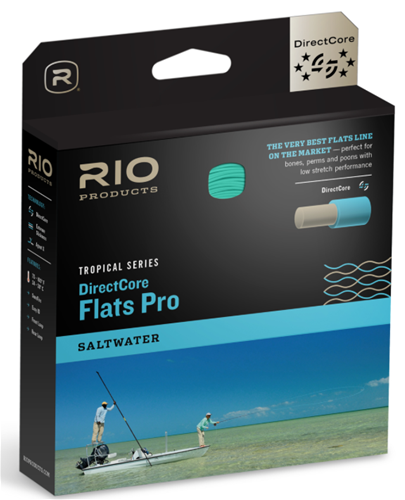 That’s why we built the Flats Pro around DirectCore, a proprietary low-memory, low-stretch monofilament core that retains its stiffness in tropical heat, yet lies straight on the water without curl or retraction. We also applied our SureFire triple-color, distance-marking technology to take the guesswork out of putting the fly exactly where you want it. Testing: …and more testing. Well, somebody has to do it, and if it takes hundreds of hours on the flats and countless fish to create a perfect line, we’re willing to make the sacrifice.